American author John Ernst Steinbeck, Jr. was Born February 27, 1902 in Salinas California, He is widely known for the Pulitzer Prize-winning novel The Grapes of Wrath (1939) and East of Eden (1952) and the novella Of Mice and Men (1937). As the author of twenty-seven books, including sixteen novels, six non-fiction books and five collections of short stories, Steinbeck received the Nobel Prize for Literature in 1962. The Grapes of Wrath was published in 1939 and won the annual National Book Award and Pulitzer Prize and was cited prominently when he won the Nobel Prize in 1962. Set during the Great Depression, the novel focuses on the Joads, a poor family of tenant farmers driven from their Oklahoma home by drought, economic hardship, and changes in financial and agricultural industries. Due to their nearly hopeless situation, and in part because they were trapped in the Dust Bowl, the Joads set out for California. Along with thousands of other “Okies”, they sought jobs, land, dignity, and a future.The Grapes of Wrath is frequently read in American high school and college literature classes due to its historical context and enduring legacy. A celebrated Hollywood film version, starring Henry Fonda and directed by John Ford, was made in 1940. 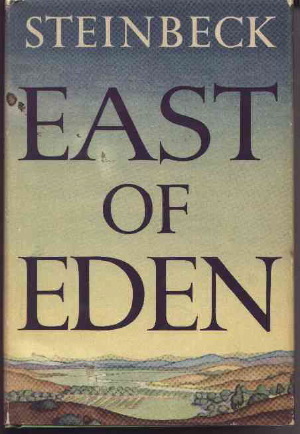 East of Eden is Often described as Steinbeck’s most ambitious novel East of Eden is set between the beginning of the 20th century and the end of World War I, It is the story of warmhearted inventor and farmer Samuel Hamilton his wife Liza, and their nine children who live on a rough, infertile piece of land in the Salinas Valley, California,. As the Hamilton children begin to grow up and leave the nest, a wealthy stranger, Adam Trask, purchases the best ranch in the Valley, Adam joined the military and then wandered the country until He was caught for vagrancy, escaped from a chain gang and burgled a store for clothing to use as a disguise. Then he learns that his father has died and left him an inheritance of $50,000. Meanwhile a girl named Cathy Ames, lives near to the brothers’ family farm. She is cold, cruel, and utterly incapable of feeling for anyone but herself and leaves home after killing both parents. Finally, she is viciously beaten by a pimp and is left close to death on the brothers’ doorstep. Although Charles Hamilton is repulsed by her, Adam, unaware of her past, falls in love with and marries her and they settle in Salinas Valley California, near the Hamilton family ranch. Cathy does not want to be a mother or to stay in California, but Adam is so ecstatically happy with his new life that he does not realize there is any problem. Shortly after Cathy gives birth to twin boys, she shoots Adam in the shoulder and flees. Adam recovers, but remains in a deep and terrible depression until he becomes good friends with Cantonese Cook Lee and Samuel Hamilton and learns the story of Cain & Abel and the Hebrew word “Timshel” which means “thou mayest” suggesting that mankind is neither compelled to pursue sainthood nor doomed to sin, but rather has the power to choose. Meanwhile, Cathy has become a prostitute and embarks on a devious plan to ingratiate herself with the owner, murder her and inherit the business. She makes her new brothel infamous and is not concerned that Adam might look for her, and has no feelings her children Caleb and Aron – echoing Cain and Abel – who grow up oblivious of their mother’s situation. Aron then meets a girl named Abra and the two fall in love. Soon after Samuel Hamilton passes away. As the boys reach the end of their school days, Caleb decides to pursue a career in farming and Aron goes to college to become an Episcopalian priest. Soon Caleb discovers that his mother is alive and the head of a brothel. Caleb then goes into business with Will Hamilton, as an automobile dealer and also makes a fortune selling beans grown in the Salinas Valley. Aron returns from Stanford for the holiday and Caleb takes Aron to see their mother, who Wracked with self-hatred, signs her estate over to Aron, who then enlists in the army to fight in World War I, but is killed in battle and Adam is overcome with grief. A now bedridden Adam is asked to forgive his only remaining son, responds by giving Caleb his blessing in the form of the word Timshel. I couldn’t get past the first few pages of Grapes, talk about depression, it was soul destroying. But I did enjoy East of Eden. Not read mice. I’ve read Mice it’s quite good, would like to readEast of Eden.